China is planning to upgrade a domestic airport to an international one in Ali prefecture of the Tibet Autonomous Region (TAR) seeking to facilitate travel of foreign tourists, including Kailash Mansarovar Yatra pilgrims to the holy site, a senior Chinese official said Tuesday. Deputy Commissioner of the prefecture in China's TAR, Ge Qingmin, said, "We are thinking of upgrading an airport in the prefecture. But, the planning is at a very initial stage." He said this in response to queries from reporters on the sidelines of an interactive session where pilgrims who have undertaken Kailash Mansarovar Yatra shared their experiences and offered suggestions. "The holy site of Mt Kailash and Lake Mansarovar is located about 200 km from Qunsha airport. It will facilitate foreign travellers taking their journey to this part of the world," Ge said. Earlier, Baimanyangzong, Director General in the Foreign Affairs Office of China's TAR, spoke about the efforts Chinese government has made and further making to ease travel of Kailash Mansarovar Yatra pilgrims. The Yatra is undertaken from July to September, one route through the Lipulekh Pass and the other through Nathu La pass. Former MP Tarun Vijay and other people shared the issues faced by pilgrims, and offered suggestions, on improving facilities near the holy site. Vijay and few other yatris also suggested that a holy dip be allowed to pilgrims in Lake Mansoravar as it is a very holy place. He also suggested that a "special travel facility can be offered to pilgrims, which is not passport-based". Li Bijian, a minister and deputy chief of mission at the Chinese Embassy said, "Holy dip has not been allowed by authorities keeping in view the fragility of the environment". "Mt Kailash and Lake Mansarovar are considered holy by many people, but there are environmental issues and, to maintain that environment, any dip is not allowed. However, people can carry back some water," he said during the event. Li said the yatra is an important segment of boosting people-to-people ties between India and China. Baimanyangzong, who is travelling to India along with a delegation said, three reception centres have been made, and other ancillary works are being undertaken. "In 2018, there was a landslide on the Indian side, and visa validity of many pilgrims had expired. We later extended their visas, so they could undertake the journey," she said. She also said that in China's 12th Five-Year Plan and 13th Five-Year Plan, a lot of monetary allocations have been made to improve infrastructure in the TAR, including building of roads, provision of electricity and telecommunication facilities. Baimanyangzong also said the yatra is an important symbol of friendly relation between India and China. 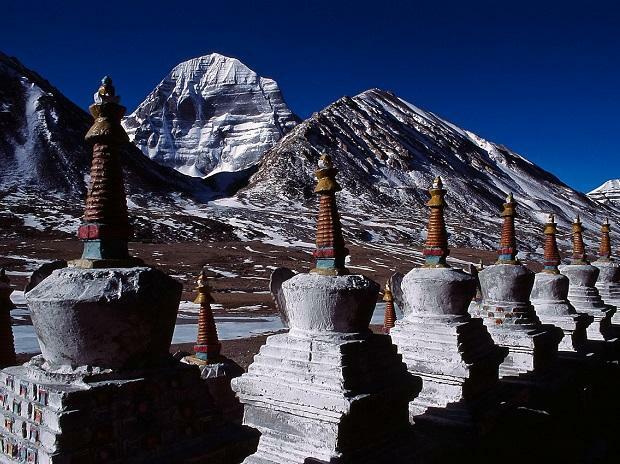 Mount Kailash and Lake Manasarovar are located in Ali prefecture. The route through the Lipulekh Pass (Uttarakhand), which involves some trekking, passes through important sites like Narayan Ashram and Patal Bhuvaneshwar. The pilgrims can also see the scenic beauty of Chialekh Valley or the Om Parvat which has the natural occurrence of snow in the shape of 'Om' on this mountain. The route through the Nathu La Pass (Sikkim) is motorable and suitable for senior citizens unable to undertake arduous trekking. From Gangtok, the route passes through scenic places like the Hangu lake, and through the vast landscape of the Tibetan plateau.